First I want to point out that these are not specifically gardening gloves -- they're general purpose, modern work gloves. Second, I want to say that although I no longer got the cheapest gloves on the rack, I got the cheapest of the "better" gloves -- these cost $10. Ooh, they look so clean! Not yet broken in -- look at that thumb! That just formed sometime in the last month or so, and obviously it's my main digging/poking/scratching finger and gets the most wear. once after I took the right glove off and held it in my left hand. Again, the left one is fine, but the seam on the right thumb is completely gone. 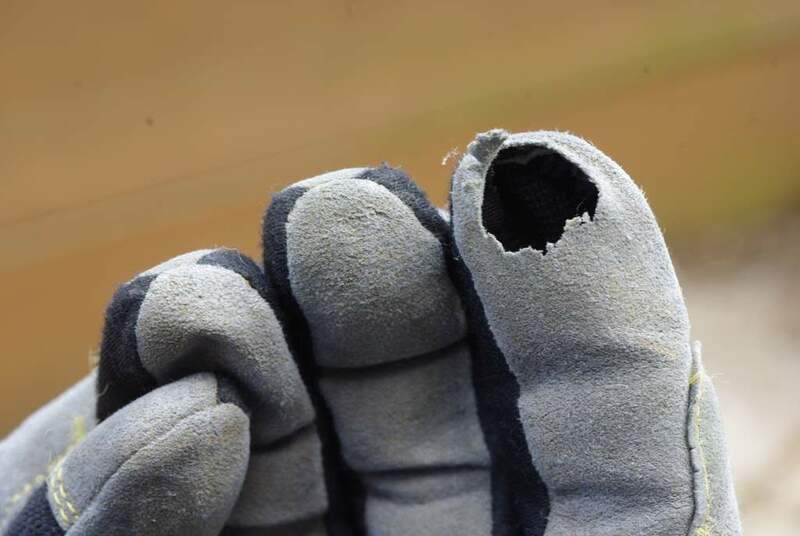 Even so, I didn't really notice a problem when wearing the gloves -- the loose thumb flap didn't get in the way or let any dirt in. Maybe it will get worse in a little while and will start being a problem, but for now it's still fine. "Powerful like a gorilla, but soft and yielding like a Nerf ball." Google it. It didn't get this way from extensive brow wiping -- I think it fuzzed up when I washed the gloves. That's one of the best features of these gloves: they're washable! That's synthetic leather, so when the gloves got too dirty I'd just throw them in a bucket of water with some soap and hand wash them, give them a rinse, and let them dry overnight. 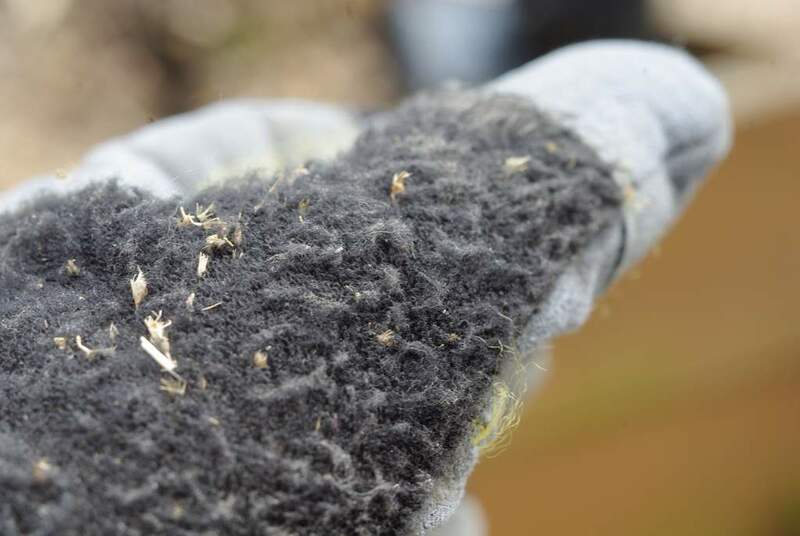 The cheap $2 gloves are useless after getting muddy or wet, because they turn crusty and even more uncomfortable than usual. These felt so nice after being washed. 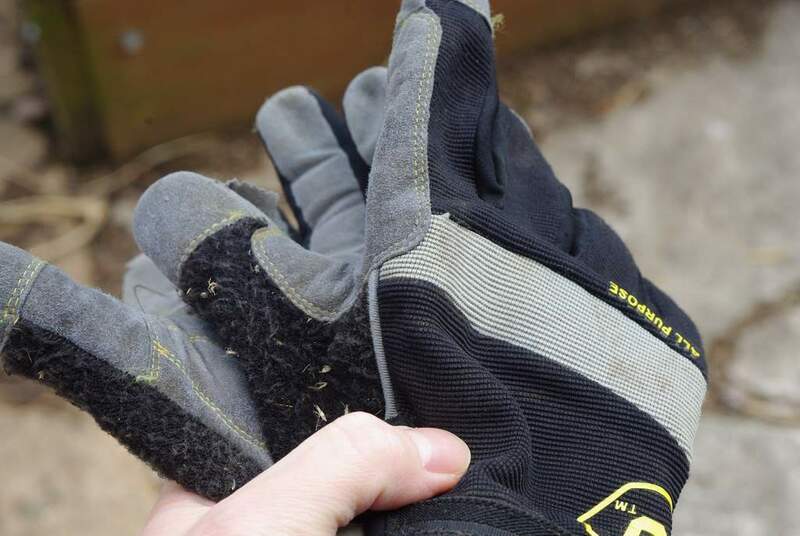 That's probably the biggest selling point of these gloves over other gloves I've used in the garden: they are comfortable! The $2 work gloves were bearable, but never comfortable. So comfortable, washable, quite durable, and only $10. Total winner! 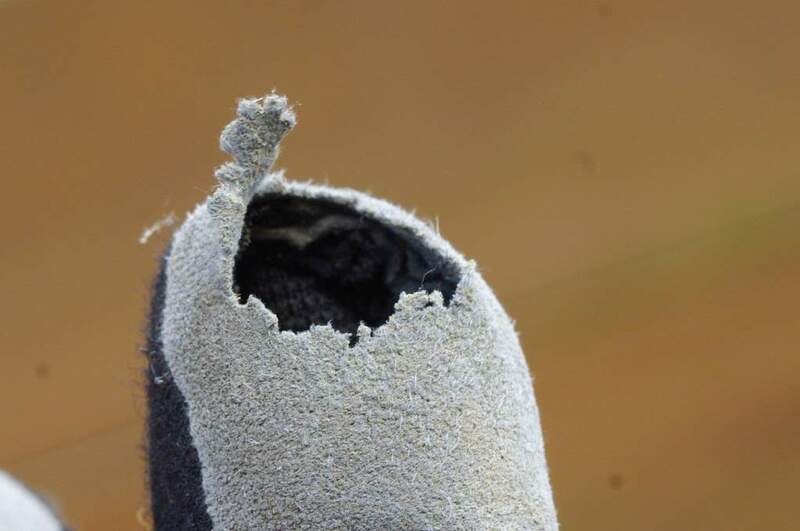 I'll be buying another pair of these this weekend, and using this worn pair as my backup or lender gloves. 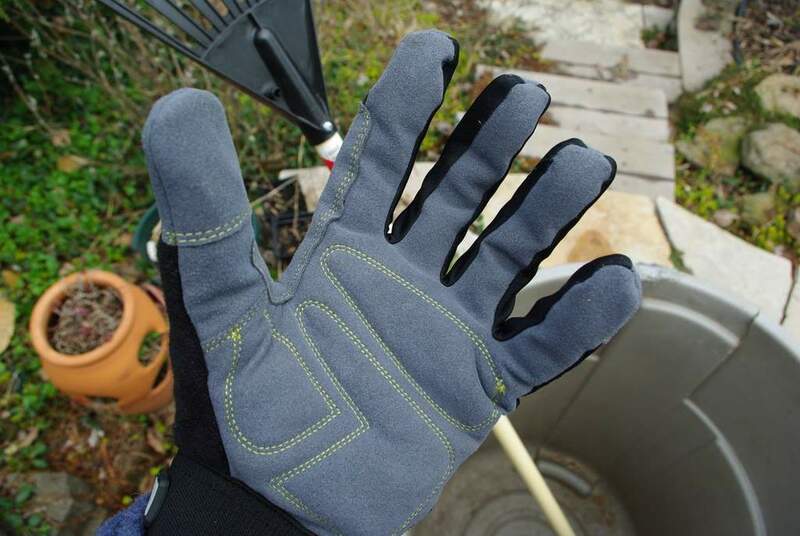 I've seen "landscaping gloves" in catalogs that look like this but may be sturdier, but they cost $30. I like getting nice tools, but that's a little pricey for me. Unless they're guaranteed to last more than three years, I'll be sticking with my $10 model. 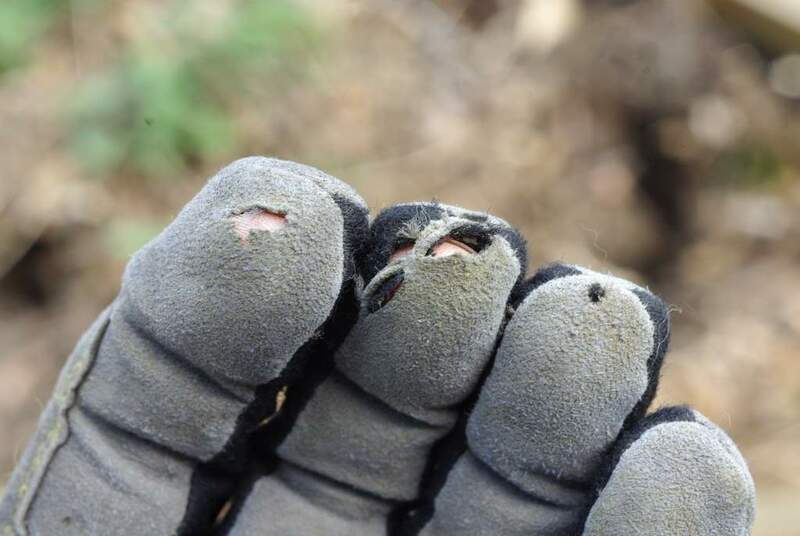 What kind of gardening/work gloves do you use, and do they have any weaknesses or great features? Let me know in the comments. 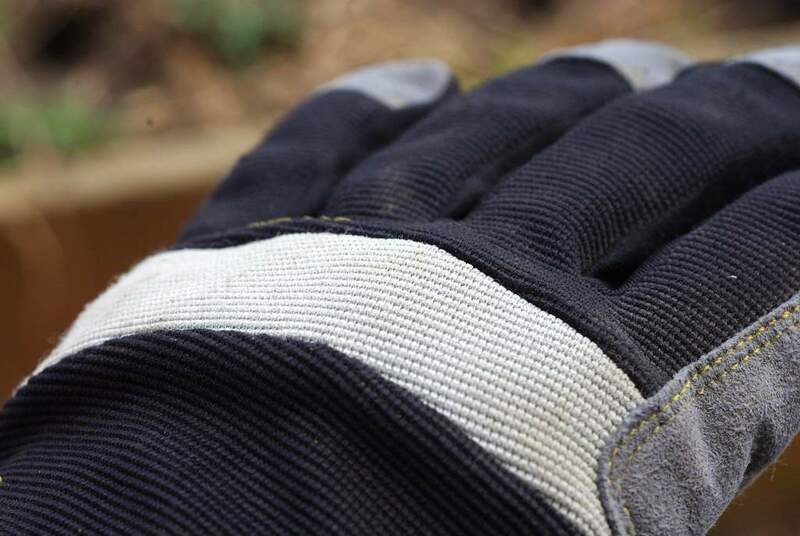 I always forget to wear my gloves when I'm gardening, which is why my hands are a wreck. When I remember, I wear Mechanix gloves. They're a little pricier ($20) but I also wear them for riding and farm chores and they hold up well. By the way, you can put leather in the washing machine, it's the dryer that will destroy it! I usually wear Atlas nitrile gloves that are unbelievably comfortable, breathable, washable and they come in fun colors. These are $7. When I need something a little thicker I like basic cotton gardening gloves. Simple & cheaper, @ $2. I should also point out that I don't use these when doing general gardening. If I'm doing light digging, weeding, planting, etc. I go bare-handed. 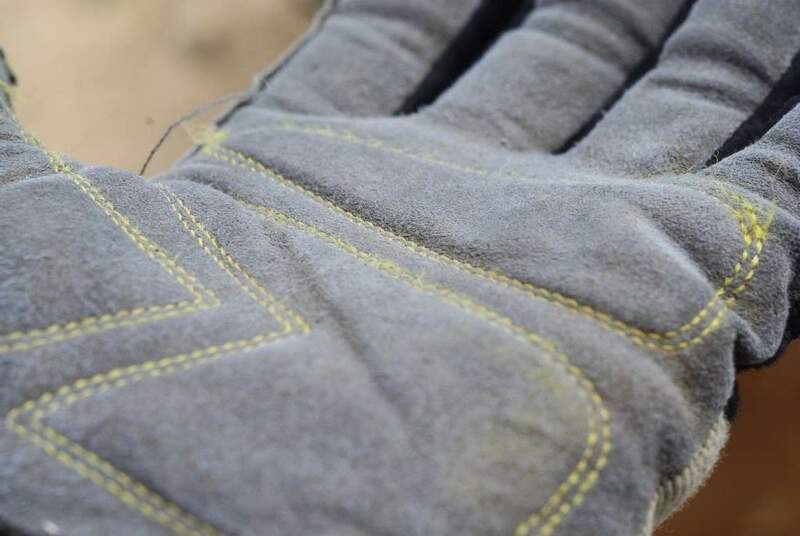 I use these gloves when doing heavier work: digging bamboo, carrying rocks, hours of raking -- any activity that requires a little more hand protection. I'm going to have to check out some of these that have been mentioned already too... keep 'em coming! I've never had troubles with palm wear. It's always fingertip holes that do me in. Washable is a nice feature, though. I prefer vinyl gloves since they don't really reduce dexterity by that much, and they are disposable, coming in packs of 100. As far as weeds, I don't even touch them unless they really start getting in the way, or are threatening to drop seeds, then I might feed them to my worms. I think I'll have to ask my Dad to bring me a pair of these gloves when he visits from the USA in August. I have not seen those here and make do with some kind of fabric gloves that are pretty useless or I wear rubber gloves that are hideous, so truth be told - my once beautifully maintained hands are now a mess and bother me a bit. Can you let me know the make of these so I can ask Dad to add to the "List of stuff to bring"? I usually purchase at least one new set of gloves per year. Much the same problem, it's always the index finger that somehow disappears. Although I tend to have a couple different pairs depending on what work I'm doing. Manual gloves like yours for raking, shoveling, firewood and other heavy chores. and like Anne I can't do without a thin pair of Atlas gloves with nitrile coating for regular garden chores. Look pretty good. I go through gloves at a rapid passe doing stonework all the time. Steve: I don't use gloves when dexterity is involved, but vinyl gloves don't protect you from sticks, sharp rocks, blisters, etc. 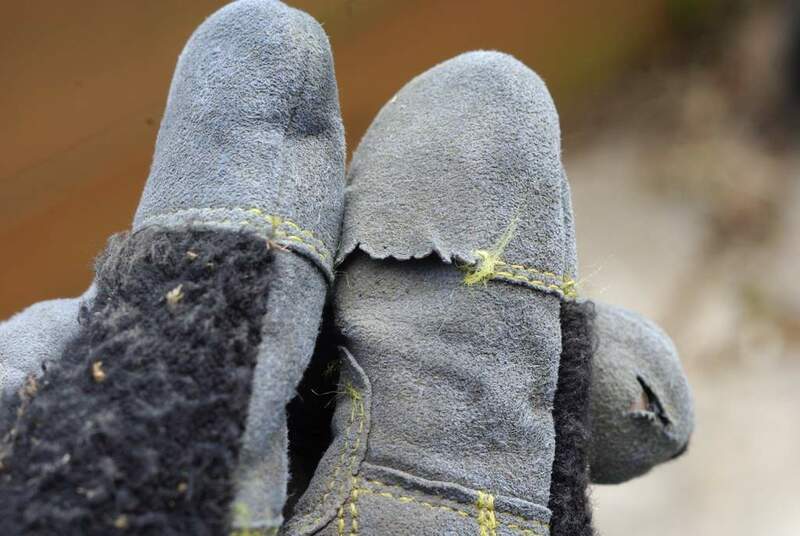 These are "Firm Grip" brand gloves, the "all purpose" model. I tried on the "heavy duty" model yesterday -- it has an extra layer on the fingertips like my gloves have on the thumb, but I found them to be less comfortable because of some rubber protection on the knuckle areas. They were twice as expensive too. 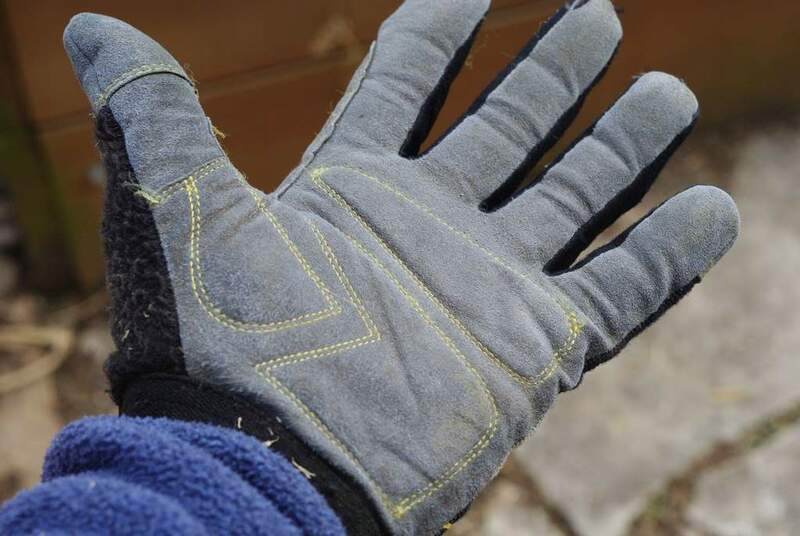 I use inexpensive knock offs of the Foxglove work gloves--thin, tight fitting, with rubberish front. But I put disposable plastic surgical gloves over them so they never wear out, are waterproof and warm, but remain thin. The surgical gloves wear out after a few months. It's a great system for me because I grow 50% 0f the plants for my nursery in the ground, and I really need to feel them when I am potting. I'd be tearing those gloves off my hands in 5 seconds. I can't work unless I can feel the soil and that means very lightweight gloves or none at all. The best ones I have found are the ones from Gardener's supply. Hi Alan, I have always used those type of gloves as well. They are about R18.00 a pair. They are terribly uncomfortable and wear away too quickly for my liking. I then started using cotton gloves and because these are 'dirt'cheap I didn't worry to thorw them away. But I have a new pair of gloves that I am testing. I'll blog about them soon! If I'm outside, I have on gloves. I love goatskin gloves. I try to find them around $10, but I don't mind buying several pair/year if I need to. The cotton $2 gloves wouldn't last a day with me! Interestingly, I just recently found a local vendor that has nice gloves - and a great fit makes such a difference! Good topic. We buy cheap gloves. We have to. When our backs are turned, the dogs nab our gloves and bury them in the back yard.